Handmade Taxco Silver Dangle Earrings from Mexico, "Swing Dance"
Sterling ribbons clasp silver spheres as they dance in shining harmony. Upbeat and modern, earrings by Guillermo Arregui exalt the precious earth element mined in Taxco. You can find sterling silver dangle earrings 'Swing Dance' by Guillermo Arregui in jewelry categories such as Modern Earrings, Taxco Silver Earrings, No Stone Earrings, Silver Earrings, Sterling Silver Earrings and Dangle Earrings. Enjoy exploring these sections for other Novica treasures. These artistic earrings are stunning and although I just received them, my first impression is how striking they are. Exceeded my expectations. These are such happy earrings, perhaps because the artist created his design as a "dance in shining harmony". I feel that energy when wearing them. Great addition to my Taxco silver collection! Thank you Guillermo Arregui! These are wonderfully stylish and call attention to themselves while at the same time complementing an outfit. They are a bit large for me but I love them. 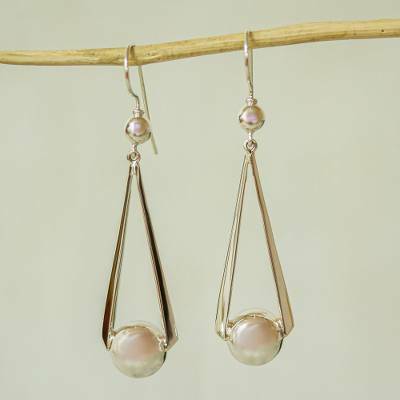 'Swing Dance', earrings hang long, move/swing. The shine, size (not too wide) make for a design that will be noticed, but will not be garish. Strong enough design not to require a necklace. The earrings are as pictured, round silver balls. The design is fun and youthful, regardless, I'm wearing them at age 77. Can be worn casual or with a dressy outfit. Solid, well made. "I enjoy life and I love being alive… I feel happy when people like my designs. I love the idea that my jewelry becomes a part of yourself when you wear it." "Hi, my name is Guillermo. I was born in Jaen, Spain. My passion is traveling and, when I was 16, I left my home and started traveling all over Europe. It was great. I saw great places and lived day by day. I stopped in the villages I liked, I worked at some simple jobs and I slept under the stars. "During my travels, I met an Italian girl. We got married and moved together to Mexico. Since that time I have been living here and I love it. By chance, in 1985, we went to Taxco and I met a silversmith who opened the doors of his workshop to me. I learned everything. I get my inspiration from everything that surrounds me and, obviously, from all my traveling. I love natural stones. I cut them and do everything myself. I love doing this, and my favorite stone is the turquoise. "The biggest gift life gave me are my four children. In children, you see real love. They teach you how to love, they accept you and, with them, you can remember the real meaning of love. "I enjoy life and I love being alive. I often think about the equality of human beings – despite the little differences, it is so important to always remember it. I feel happy when people like my designs. I love the idea that my jewelry becomes a part of yourself when you wear it." My beloved husband has just been diagnosed with an aggressive cancer. In our marriage vows, I asked God to give us forever together...and one more day. The beautiful ring is a symbol of forever. In fact, I had it engraved with that word. Thank you, Mr. Arregui .